Emergency Plumbing services to Southfield Michigan, offering 24 hour response by trained and certified master plumbers. We are the tri-county areas most reputable emergency service plumber. Our team is on call and ready to respond to broken pipes, failed hot water heaters, broken sump pumps, clogged and drain backups. Call us and discover the difference with prompt and courteous service today! Dealing with plumbing issues in your home or business can be uncomfortable and unsanitary for all involved. When a plumbing issue arises, you will need the help of experienced plumbing technicians to get your systems back on track with no further hassle on your end. Luckily, you have come to the right place. The Tri-County Plumbers of Michigan have experience in the field and are ready and willing to help you with any and all of your plumbing needs. We are available 24 hours a day, 7 days a week, and 365 days a year with no extra charges! When it comes to equipment and manpower, we only employ the best of the best. Our equipment is up-to-date as well as high tech, and the best available in the plumbing industry today. Our local Southfield technicians have undergone extensive background checks and many training programs to ensure that they are up to par and exceed all industry standards. Count on us for any plumbing emergencies in Macomb, Oakland and Wayne County. 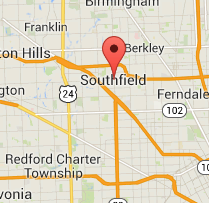 Because we are a local Metro Detroit, MI company, we can arrive to your Southfield within an hour of your call to us. We will show up on time, listen to your problem, and then analyze the situation at hand. When you go with the Plumbing Pros, there will be no hidden fees or gimmicks! We prepare the pricing by the job, not by the hour, so there are no surprises. Our technicians are experts in the latest advances in the plumbing industry, and stay up to date on the latest techniques so that we can provide you with the best service possible. When our master plumbers arrive to your home or business in Southfield , they will wear shoe covers, use drop cloths, and also clean the work area after the job is finished. We want to provide you with the best service available, and we are not happy with the job until you are. If that means working around the clock to get the job done in a timely manner, than that is what we will do! We know how important it is to get the job done while still respecting your privacy. No job is too big or too small for Tri-County Plumbing! Whether it is a re-piping on a small residential home or a full system installation on a commercial property, we are fully equipped to undertake either with ease and expertise. Our company is fully licensed, bonded, and insured, and we also follow all local codes and ordinances in your area. If there is a permit that we may not have in your area, we will obtain it for your peace of mind. Our plumbers pride themselves on the knowledge and the skill set they have in their craft, and promise to deliver quality service at a great cost. 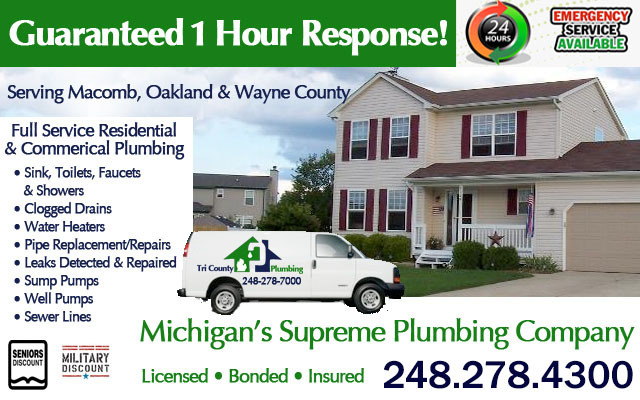 We provide residential and commercial plumbing services all over the state of Michigan, and are available for your call 24 hours a day, 7 days a week, and 365 days a year. We want to be the ones you call in Southfield for your plumbing issues, because we know we can get the job done right the first time around.